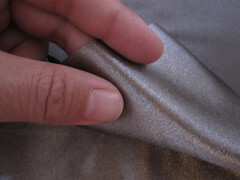 I have recently ordered sparkfun conductive fabric (MedTex180), which is similar to LessEMF stretchy fabric but much thicker and stiffer. 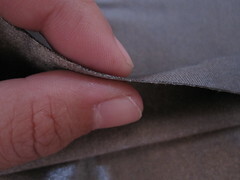 The structure of the fabric is more like a rib than Lycra. 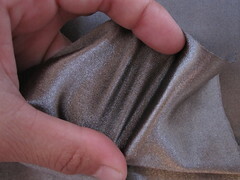 The front side is very shiny and you can see the rib structure from the back side. It stretches very well on once direction but not at all for the other. 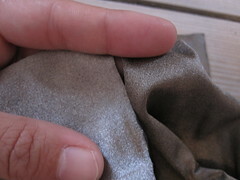 When measuring resistance over 10cm2 fabric, the sparkfun conductive fabric (left) measures less than 1 ohm/10cm2, while LessEMF stretch conductive fabric (right) measures 2ohm/10cm2. This post is not to compare which is “better”, but to understand the difference so you can pick the suitable one for your project. 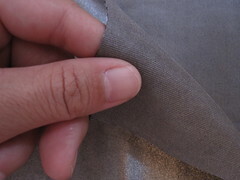 When you use MedTex180 for fabric traces, you have to be careful which direction you are cutting the fabric, and which direction the trace needs to be stretchy. 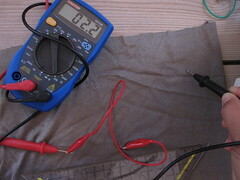 I used MedTex180 for Solar T-shirt II project and it worked wonderful. Could you please fill me in on which material is stronger? I have the Less EMF material and it unfortunately quickly broke down during a stress test with Velcro. Thanks! I am wondering if your interpretation of the measure is correct. First, according to the picture the area is 10 x 10 cm, meaning 100 cm2, not 10 cm2. 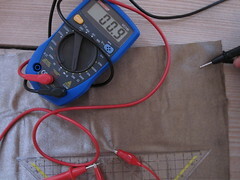 Second, what you measure is the resistance for the shortest path between the electrodes (the diagonal in your example – something like 14 cm), meaning that the measurement is for a distance, not a surface. 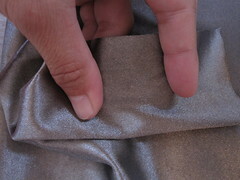 Does electrical resistance change when fabric is stretched? 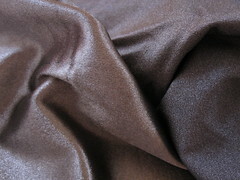 Any chance of getting a small sample of your MedTex 180 conducive fabric. I work with lots of disabled kids and need to fabricate custom iPad styli, which they can use. 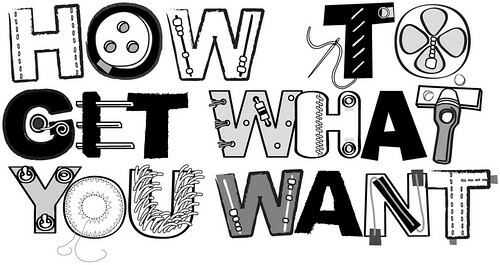 Could I possibly get a small sample of your MedTex 180 conducive fabric? I am a senior at The Science Academy of South Texas and am in a group working on a SIDS (Sudden Infant Death Syndrome) preventative pressure sensor onesie that would greatly benefit from this product. I would appreciate knowing your response as soon as possible.